October has been a very active and engaging month for Green Hope. We planted 375 trees in Toronto to offset our carbon footprint and conducted a neighbourhood recycling campaign in the UAE. Dubai, UAE, November 01, 2018: Our team in Canada, conducted a workshop for teachers at the University of Toronto's Ontario Institute for Studies in Education during the fall 2018 Toronto Schools Board's Eco-Schools Conference titled 'Engaging With EcoJustice: Environmental Education & Equity in Action'.. 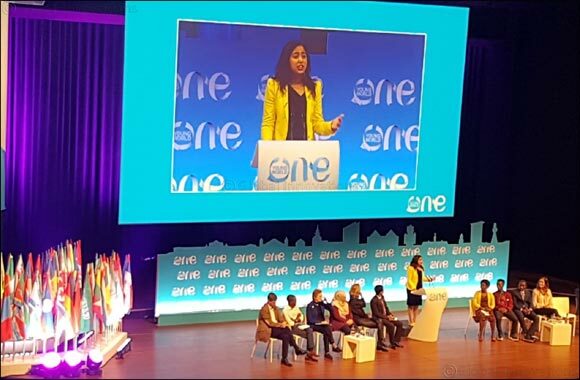 I was privileged to speak at the One Young World Summit at The Hague at the Environment Plenary! It was a great honor to share our work! We also celebrated #InternationalDayOfTheGirlChild with young people from North America through a webinar! The purpose of this day is to promote awareness and action with respect to the unique challenges and issues girls face both nationally and internationally. The three primary goals of this conference were to::1. Raise awareness on issues faced by girls around the world. 2. Consider solutions, and 3. Motivate engagement. It was a huge honour for me to be invited to be a delegate and a speaker at the Youth Forum organised in Sharjah, UAE, under the patronage of Her Excellency Sheikha Jawaher bint Mohammed Al Qasimi. Sharing our journey is always so motivating.